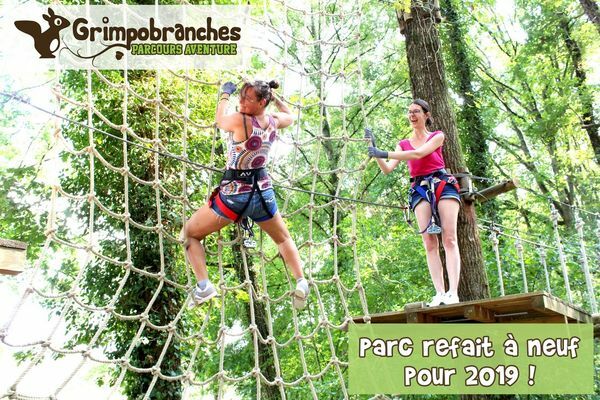 The Parc Grimpobranches Orient is a leisure area located in the heart of the Orient forest, 20 minutes from Troyes, 25 minutes from Bar sur Seine, 35 minutes from Bar sur Aube, just opposite Lusigny sur Barse beach. It offers 3 activities: Accrobranches, Bubble Foot and Canoe Kayak rental. For the Accrobranches, once you have paid your entrance fee, take full advantage of all 8 courses and this in an unlimited way! Accessible from 90cm (3 years old), come and have fun and challenge yourself with family or friends in 150 workshops in complete safety thanks to the continuous lifeline! The Park also offers nightlife, find out more and enjoy a unique and friendly experience! Bubble Foot is played from 4 people, 1m20 minimum. Various games are offered on a 350m² plot of land inside the Park in the forest, over sessions of 30min or 1h. Canoe Kayak rental is available on the lake, from 5 years old, on sessions of 1h, 3h or the day. It is mandatory to be able to swim. After your activity, you will have the opportunity to relax and swim on the beach just across the street! Open from the 1st Weekend of March to mid-November. Except school holidays: every Wednesday (May - June - September), Saturdays, Sundays, public holidays and holidays: from 2pm to 7pm. During school holidays (April: zone A - B - C): every day from 2pm to 7pm, Saturday and Sunday from 10am to 7pm. - during school holidays (zone B): every day from 2pm to 6pm and from 2pm to 5.30pm from 1st to 4th November included. There is no review about Grimpobranches, be the first to leave one !